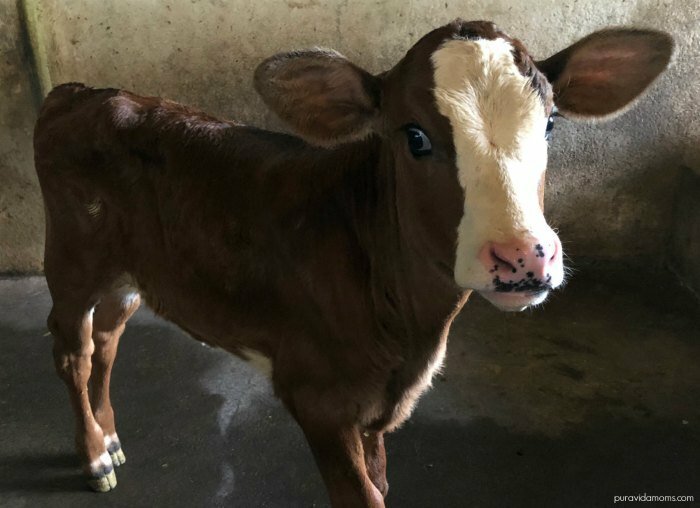 Rancho Margot Costa Rica is a farm located near the Arenal Volcano- and the perfect destination for families with young children. 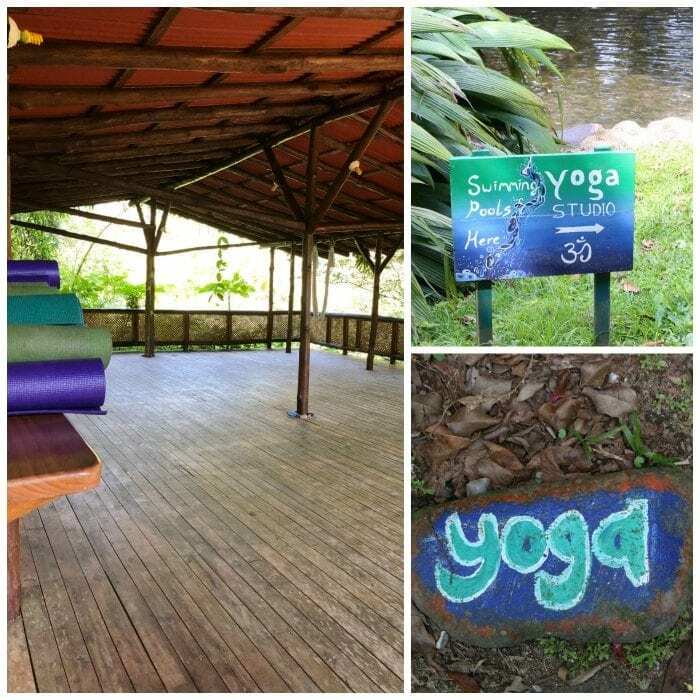 All meals and twice a day yoga are included- as well as farm tours, cow milking and beautiful hiking trails. It’s a must-visit destination for Costa Rica travelers! 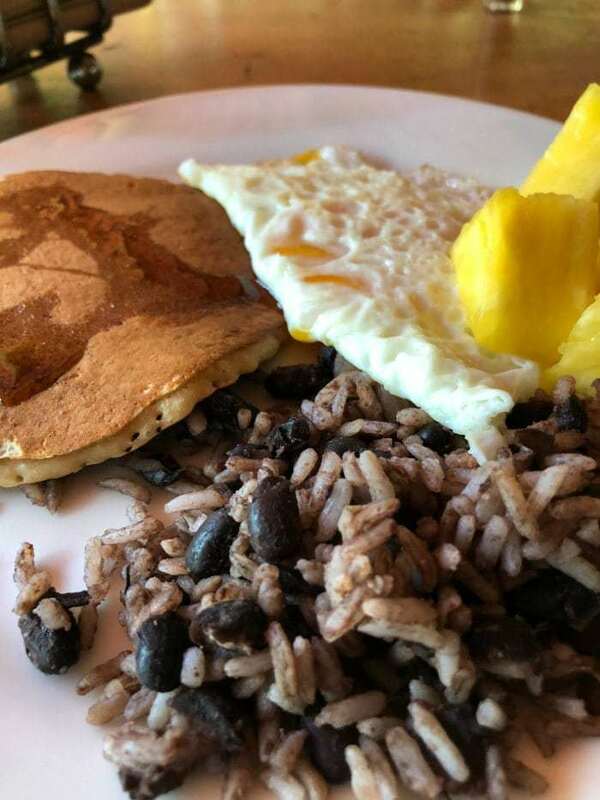 We had the incredible opportunity to stay as fully hosted guests of Rancho Margot Costa Rica for two nights and three days recently and our family had an unforgettable experience. We’ve now partnered with Rancho Margot to offer Pura Vida Moms readers a discounted stay- more details at the bottom! Rancho Margot Costa Rica is an all-inclusive (except some tours and alcohol) completely off the grid and fully self sustainable farm located near the Arenal Volcano just outside the town of El Castillo. 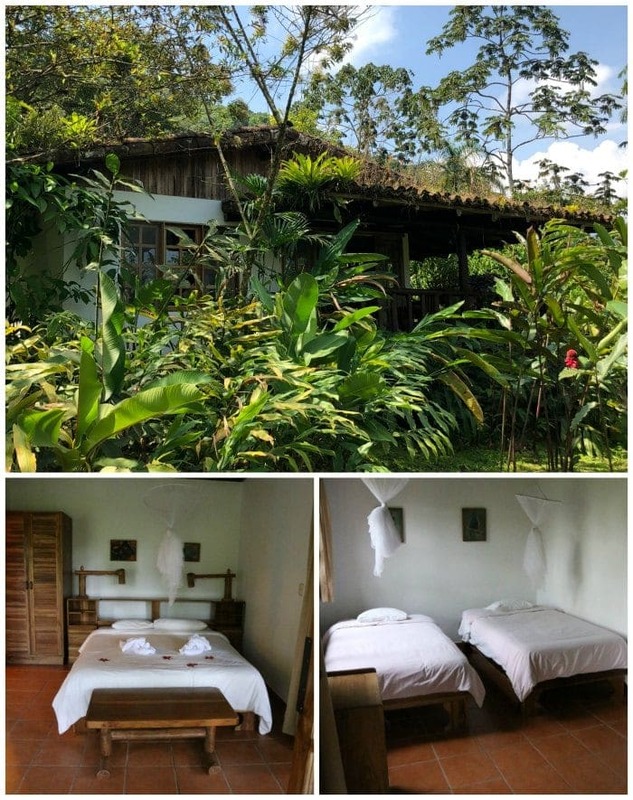 The farm is situated on prime forest near Volcano Arenal National Park, The Children’s Eternal Rainforest and is the last privately owned land on the edge of Monteverde National Park. Here’s a quick overview from Sanjay Gupta of CNN. The location of Rancho Margot Costa Rica is not only incredibly beautiful, there are also tons of learning opportunities and fun experiences for families with young children. We saw red eyed frogs, milked cows, fed pigs, tromped through the rainforest and saw fish and tadpoles in the pond. Twice a day yoga is included in the price- which meant a happy and refreshed mom! And the food… everything is sourced right from the farm, made from scratch and cooked in a wood oven. In order to arrive at Rancho Margot, you will take the road that leads to Parque Nacional Volcan Arenal- it’s before the dam on the way to Tilaran from La Fortuna. From there, you will follow signs to El Castillo, or just keep right. The road is completely dirt and a bit hilly. If you don’t have a 4 wheel drive vehicle, plan for the ride to take a good hour in dry season- I wouldn’t recommend it in rainy season. Otherwise, the drive is about 30 minutes from downtown La Fortuna. There are not a lot of signs for Rancho Margot on the way, but it’s also not hard to find. For families, the best accommodation is a bungalow. It’s a self standing room in the rainforest with two twin beds and a double bed, a sink, shower and outdoor hammock and table. There’s a full wrap around porch and railing- it’s truly beautiful. The bungalows are situated off of an uphill cement path, and are very private and surrounded by tons of rainforest flora. The ranch also has an electric golf cart for those who may not be able to walk up that path. Rancho Margot also offers a bunkhouse shared lodging as well as month long volunteer opportunities and 200 hours of yoga teacher training. Rancho Margot is a farm! 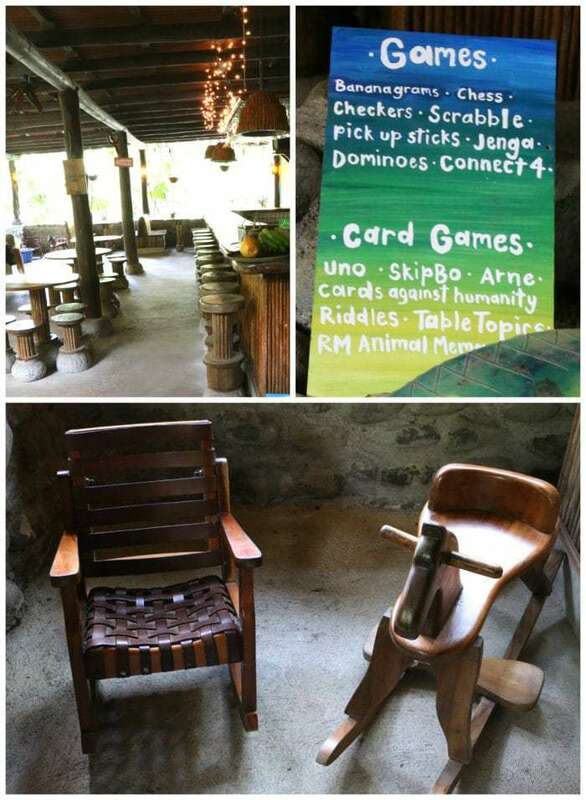 There are hiking activities, horseback riding, swimming, etc. But it’s not fancy at all- the visitors are mostly families and young solo travelers, and there is no expectation for dressing up for meals or anything. In fact, you can expect to get dirty at Rancho Margot- so I say leave fancy clothes at home or in your suitcase for another part of your Costa Rica trip. The weather in the zone near Rancho Margot is generally hot, so pack for hot weather, and then you should be fine with just one long sleeve shirt and a pair of long pants. Hiking boots or sturdy tennis shoes are a great idea, as is rain gear in the rainy season. Bug spray is a must- we used a blend of citronella and olive oil. I will say that, as per usual, I was absolutely eaten alive, so I wore long pants and long sleeves pretty much the whole time we were there. Rancho Margot provides their own homemade soaps in the rooms and natural bug repellent is sold at the front desk. There is a swimming pool at the ranch, and so bathing suits are recommended too! Ready to book? Pura Vida Moms has a special discount for you at the bottom! 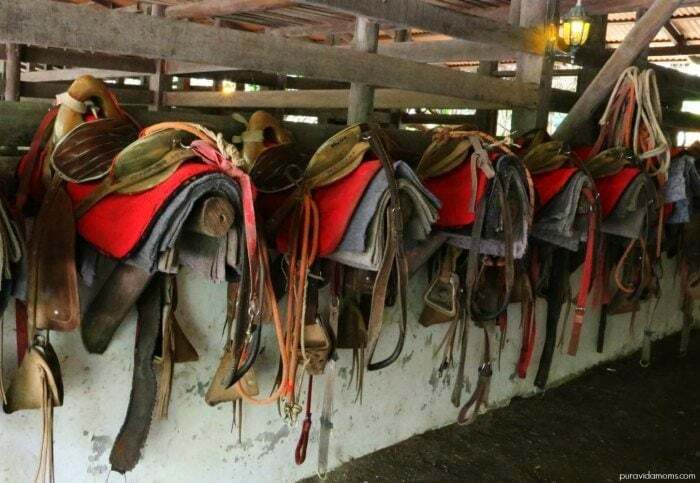 Not only can the staff at Rancho Margot set you up with all kinds of amazing tours in the La Fortuna area at a great rate, the farm itself has tons to explore. 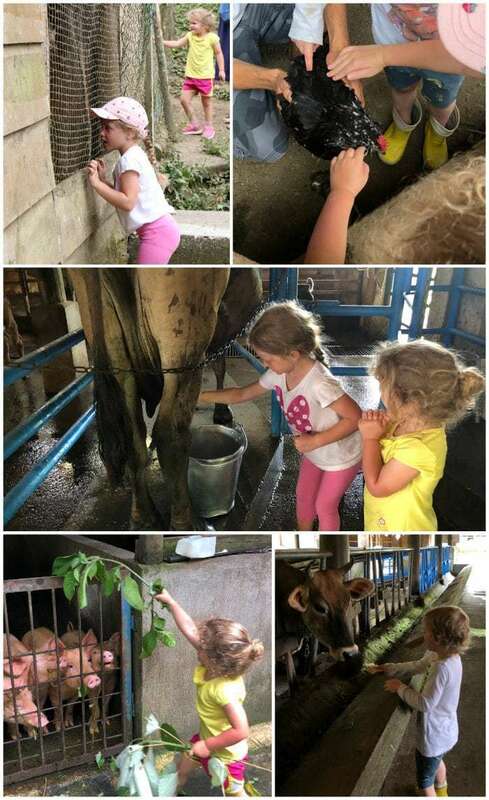 The farm tour is a must for anyone- but our kids had the BEST time with the guide Aurelio. He made the tour super exciting for our girls aged 2 and 5, and made it interesting for the adults too. We saw a myriad of plants, a red eyed tree frog, a baby hummingbird in it’s nest. We also saw chickens roosting, fed pigs and cows, walked through the gardens and the living pharmacy and generally laughed and played a ton. It was the highlight of our trip. There are great hiking trails at Rancho Margot too. The volcano is not visible from the ranch, but there is a quick and beautiful overlook hike that takes you to spectacular views of the volcano and the laguna. And don’t forget that there is yoga twice a day included with stay, and a stable full of horses, which my kids petted and fed for literally hours. We also got to milk the cows, which happens twice a day, and was another highlight of the trip. Right near the bar/restaurant there is a typical Costa Rican play structure with a seesaw, monkey bars and slides. But my favorite part of the trip was connecting with the other travelers there- there were other families with young children at the ranch, and the kids had a blast playing! The bar had a set of dump trucks and mega blocks for the kids to play with while the parents socialized. We made a very good friend named Jimmy from Amsterdam, who spoke to my girls in Dutch to while the responded in Spanish. Talk about an amazing world schooling moment for everyone- we now have three new Dutch words in our vocabulary at home- pannenkoeken, coe and our favorite: sinaasappelsap! Finally- Rancho Margot offers TONS tours around the La Fortuna area and on site, and the prices are excellent. I wish we had done the night tour- which actually starts before dusk in order to show guests the transition from afternoon to night. I guess we’ll have to go back… (darn)! Ready to book? Book through us below and save! Rancho Margot is at the top of my must-visit list for Costa Rica travel because it is a place that truly represents the culture, ecosystem and commitment to sustainable living that is a huge part of daily life in Costa Rica. We will definitely be visiting Rancho Margot for many years to come! I will say that we stayed for two nights and it was not enough to really explore everything the farm has to offer- I would recommend 3-4 nights as an idea stay, and that is definitely what we will do next time. And guess what?!?! Rancho Margot has partnered with Pura Vida Moms to offer a discounted stay for our readers! Simply fill out this form and a representative from Rancho Margot will reach out to customize a stay for you and your family! Please note that your information will be used solely for the purpose of connecting you directly to the representative at Rancho Margot in charge of discounted stays for Pura Vida Moms readers, and for no other purpose. 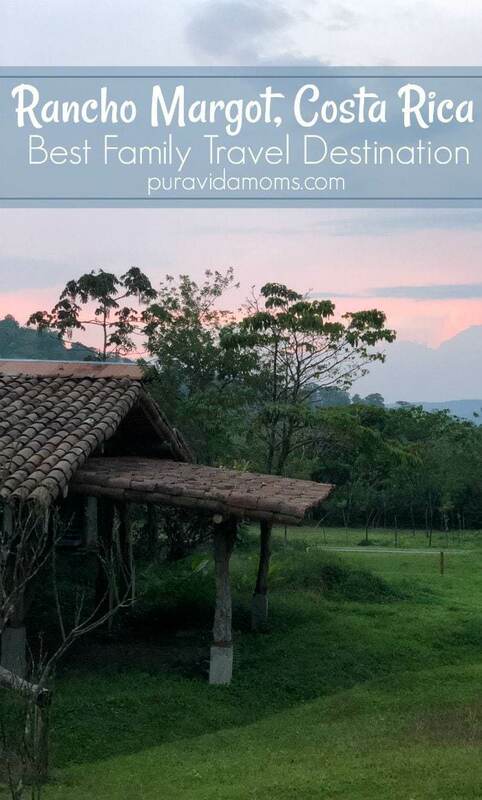 Looking for more Costa Rica family travel resources from Pura Vida Moms? Love to read your story! Well done! Jimmy still misses the girls! Big hugs&kissis from the Amsterdam family, Jorn, Marielle& Jimmy???? Thank you so much for reading and visiting the page! We miss you too- what an incredible experience to have had with your family! Love from all of us at Casa Pura Vida!